How Doth the Little Crocodile, by Lewis Carroll! The melody is creepy too! You can almost hear the crocodile slowly sneaking up. I have always relished this short poem from "Alice in Wonderland," and enjoyed Alice's bemusement at not being able to remember the CORRECT poem about a busy little bee. One of my young students feels just the same way as I, and decided to recite it for me. As he spoke the words, the tune built itself in my head! I had to write it down, and the following 3 arrangements are the result. 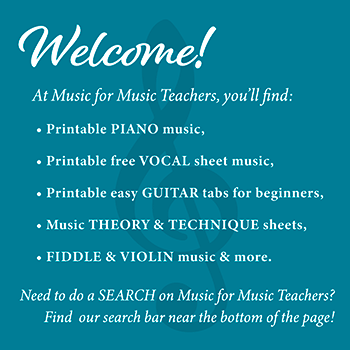 Please scroll down the page for the links to the free printable music. Can you hear the crocodile creeping closer? On page 2, both hands drop down an octave, and I thinned out the left hand accompaniment a bit so as not to be too heavy. By the way, there is nothing particularly EASY about this little arrangement. I like to use these simplified Middle C arrangements of songs as a kind of note-naming, note-WRITING homework for my students. They take a sheet home, together with a helper page to identify the notes from Low C to High C, and write the names on the page with pencil. More often than not, they will also spend a little time trying this new song out! I plan to write a duet accompaniment for this arrangement... check back.